32 people travelled by J. Smith’s Coaches of Dalton, some having come from as far away as Whitby and Carperby to park their cars at the coach depot. From Thirsk the journey began at 5am, and partly due to delays at Eurotunnel and the legal requirements for the driver to have certain rest breaks en route, the coach did not arrive at Ormesson until 8.30pm. This was difficult because some French ‘hosts’ were waiting to greet their guests, and the hotel chosen for the choir went to automatic registration after a certain time. However with excellent assistance and negotiation from M. Barriquand, all were eventually settled in their respective places. There were 14 others who travelled by car or Eurostar train who linked up with the main group. Sunday. Those at the hotel were taken to Champigny RER station to go to explore Paris. Those with French hosts were entertained individually. Monday. An outing to Paris was arranged by Odile Hugnet, with two coaches including the usual BON twinning party and NYC. We visited Malmaison, the home of Josephine, once the wife of Napoleon Bonaparte. Then a three course lunch with wine and coffee was served to all in a restaurant nearby. From there to La Défense, the modern area which is still developing and (despite past reservations about a cold and windy architectural disaster by some) got the approval of our guide who lived there very happily. Certainly there is a great view of the Arc de Triomphe in direct line from the Grande Arche. The choir returned to Ormesson for a quick rehearsal, and then a concert in the church next to the Town Hall. 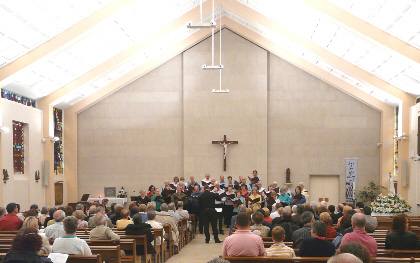 This was attended by a good audience, who were very appreciative of the mixture of French and English church music. Tuesday. 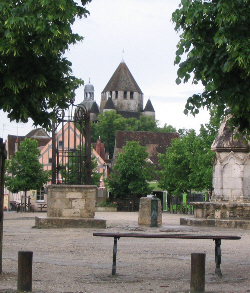 Many French hosts were going to work, so NYC arranged a trip to Provins, a medieval walled town of significant historical interest. Although the weather was a bit showery, it was still possible to enjoy this day and to have lunch in our own choice of restaurant. The site was extremely busy with many school parties; evidently it was that time, near the end of the school year, when school trips are universally arranged. That afternoon, the Allertonshire School Blues Orchestra and Concert Band had been joining forces with a local music school wind orchestra, entertaining children from local schools. A Grand Concert of 2 bands, and 4 choirs was to follow at 8.30pm. Our return was in time for rehearsal on our own and to review the acoustic. The Cultural Centre at Ormesson has a good stage area and excellent seating for the audience including a balcony. The 3 other choirs entertained in order and used at least 30 minutes each. NYC was last before the interval, and in contrast we stuck to the 10 minute programme we had been asked to prepare. However we were well received, and the enthusiastic applause from the school band for the Teddy Bears’ Picnic was much appreciated. The time was already 10.30pm, and our coach driver was waiting to take the people back to the hotel as he was to start the long drive back home at 8am the next day. Those people had to leave as there was no other way for them to get back later; although it was a pity they did not hear the school bands, or join in the ensemble singing of the European Anthem at the end. A few of us (with French hosts) stayed on, and indeed the standard of the many pieces of music played by the youth bands was excellent. The concert eventually finished at 12.30am! Those who stayed with hosts were very enthusiastic about their welcome and hospitality, and were pleased they had chosen to join in the ”twinning” in that way. Those in the hotel were sorry they did not have a chance to get to know Ormesson, as their situation was rather outside the town. The basic hotel, whilst reasonably clean and functional, had no communal area for people to get together at the end of the day and the rooms were small. However they did say the restaurants nearby, especially the fish one, offered a good service with good value meals. Their return journey went without a hitch. NYC is grateful for the hospitality shown by the people of Ormesson, and especially the church used for our concert. We have sent thanks for the excellent accompanist, and for the organisation skills of Odile Hugnet, Edmund Barriquand, Alan and Lesley Shaw.